OXFORD, Miss. – The University of Mississippi is the newest member of an elite group of 18 universities that make up the National Institute for Pharmaceutical Technology & Education. 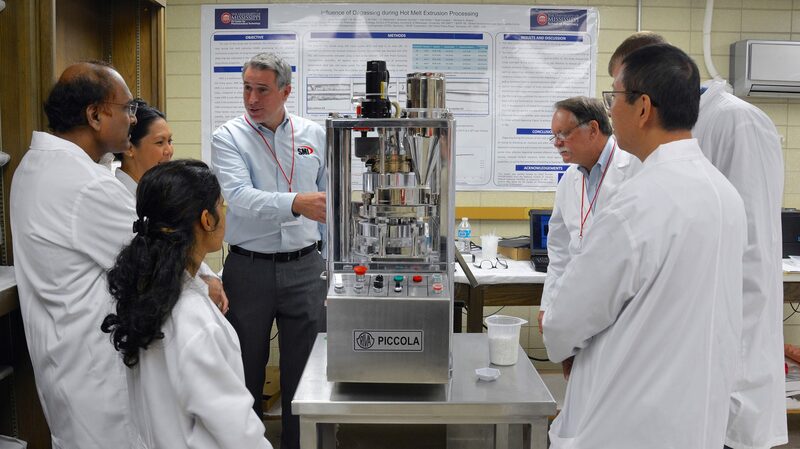 NIPTE is a nonprofit organization that works to improve the design, development and manufacturing processes of pharmaceutical products by connecting members of the pharmaceutical industry with top-ranked pharmaceutical educational programs. “The University of Mississippi was selected to join NIPTE due to our exemplary faculty, facilities and reputation in key pharmaceutical areas that complement and strengthen the NIPTE mission,” said Mike Repka, chair of the School of Pharmacy’s Department of Pharmaceutics and Drug Delivery. The university’s, and specifically the School of Pharmacy‘s, research infrastructure, pharmaceutical manufacturing expertise and related graduate programs fit well within NIPTE’s goal of improving the way pharmaceutical products are manufactured, said Walt Chambliss, UM interim associate vice chancellor for research and sponsored programs and professor of pharmaceutics. “We believe being a member of NIPTE will enhance our ability to secure research funding to make significant advancements in pharmaceutical development and manufacturing,” Chambliss said. NIPTE also offers membership to faculty and researchers from member universities who work in related fields, making it easier to collaborate on multidisciplinary projects. Ole Miss is the third SEC institution to join NIPTE, following the University of Kentucky and Texas A&M University. Chambliss also noted that the National Center for Natural Products Research, which is housed within the school, stands to benefit from the university’s NIPTE membership, as NCNPR scientists can offer their specialized expertise in natural products pharmaceutical development. “Being part of a network of pharmaceutical scientists and engineers with interests in pharmaceutical development and manufacturing is a key benefit of NIPTE membership,” he said. This membership complements several initiatives within the School of Pharmacy meant to advance pharmaceutical development, including the Hands-On Course in Tablet Technology, the Natural Products Training Laboratory and the new industrial pharmacy master’s degree track. As part of the membership, pharmacy Dean David D. Allen will serve as a member of the NIPTE board of directors, helping oversee its financial matters and ensure the success of ongoing projects. “The School of Pharmacy is thrilled to represent the University of Mississippi by offering its broad pharmaceutical research expertise to help solve challenges within the pharmaceutical industry,” Allen said.